A rose is the ultimate special way of letting someone know he or she is special, and now there’s a rose that’s really more than just a rose. Mail Boxes Etc., has come up with a unique way of expressing those holiday greetings, wishes for a Merry Christmas, and of course, the special whispered words ‘I Love You’, making it easy to send a message in a very special way. 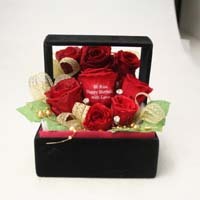 It’s a Message Rose, a fresh or preserved rose that carries with it a message affixed to the rose. Since every message is special to someone, MBE has a set of expressions to jog the memory, or customers can create an original set of words. The message allows 30 double-width letters at 10 per line. MBE is ready to deliver the Message Rose to all domestic locations, with exception of certain outer islands. Roses being plants, they cannot be sent to international destinations. The Message Rose is available in pink or red, with any numbers between one and eight. The fresh Message Rose is ¥2,500~6,000, including an optional limestone decoration. 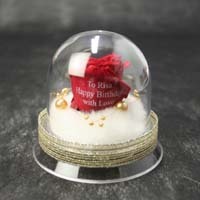 The preserved Message Rose is offered at ¥3,000~7,000, shipped in a glass case or a box. A flat fee of ¥525 covers shipping cost to most domestic locations. The Message Rose must be ordered five days before the specified delivery date. MBE, which provides a wide range of business support globally, including copy-making, management of digitized information, and packaging and shipping, is located in Naha City. The Message Roses can be made at (098) 951-2522, or by email to n-matsuyama@mbe.co.jp.